The jumbo panel and pole display boards are the ideal solution when creating large exhibitions. 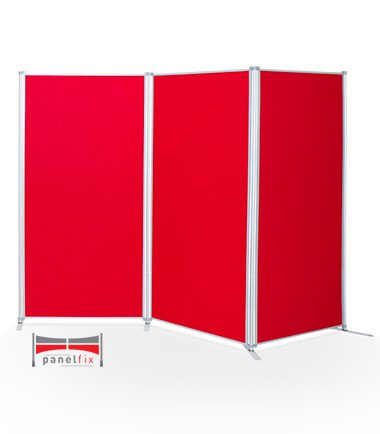 Set upon stabilising feet, these display boards are available with 2 panels right the way up to 10 panels, providing plenty of space to create impressive displays. These are all covered with a loop nylon fabric. Available in a wide selection of colours, the core benefit of this material is that pins are no longer required with the display, preserving both the content and the panel itself. All of the jumbo panel and pole display boards are designed to excel in busy environments such as exhibitions, trade shows, art exhibitions, schools and more. These make the most of lightweight panels which are compressed to give them strength, while at the same time are easy to pack away and transport. The hinges of the display boards are flexible, allowing the display to be set up in a variety of orientations. All the display boards are made to order, which means that each can be tailored to meet the demands of the client. With a wide selection of fabric colours to choose from, your display boards can also be personalised with a range of panels, a selection of compatible accessories or even a carry bag.